Chelsea gardens, understandably, concentrate on 'aesthetics'. Vitruvius' word for this was 'Venustas'. Deriving from the name of the goddess Venus, it should be taken to include beliefs and philosophical ideas - which are in too little evidence at Chelsea. The phrase 'inspired by' often appears in designers' accounts. Though it is better for a garden to be 'inspired' than 'uninspired', I find the phrase too individualistic. Great arts rest on great principles. The Telegraph Garden was 'inspired by geological events'. I think the designer (Andy Sturgeon) was lucky to win a Best in Show Award. It was 'inspired by “things I have seen from my travels around the world"' Geology is a fundamental process more than a set of images. I would rather have seen it related to a specific locality than a vague nod to the Sierra Madre and the Andes. One sees this in Japanese gardens. L'Occitane Garden is explained as 'a recreation of the beauty of the harsh yet varied environment of Haute Provence'. As I listened to admirer's comments, I found that the idea worked: 'very evocative', 'very South of France', 'very fragrant' 'reminds you of your holidays'. These are all good thoughts for a perfume company which uses local herbs. L'Occitane is pronounced lox-ee-tan. The 'Antithesis of Sarcophagi' is well-named and is a successful design - but it could have done with a better story. The designers say it is 'a world turned inside out: a garden inside a sculpture; desolation verses life; civilisation verses nature'. I prefer to think of it as new life arising from a sarcophagus, as it always does: renewal without conflict or desolation. The M&G Garden, by Cleve West, was 'inspired by the designer's memory of ancient oak woodland' and thus 'a metaphor for the sponsor's values: strength, growth, longevity and reliability'. As a design objective, this is a marketing exercise. But as an aesthetic exercise, I like the contrast between clean shapes of paving and water with the wildness of the the trees, rocks and plants. Husqvarna being a manufacturer of garden machinery it is not inappropriate for the design, by Charlie Albone, to create a good exercise area for hedge clippers, lawn mowers etc. 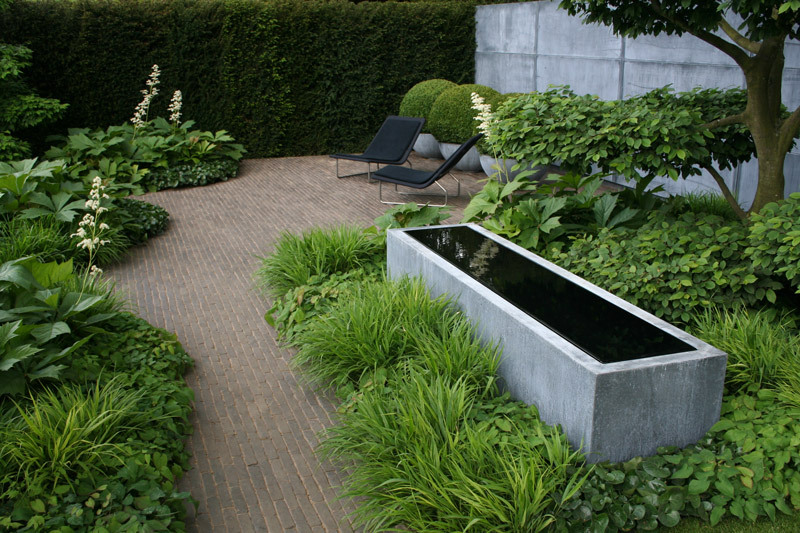 But this is at odds with the objective of a making a garden as a 'retreat from the speed of modern living'. The almost-standard Chelsea feature of a roofed sitting area, which we used to call a logia, would be a great place to relax when the machinery has been put to bed. The Winton Beauty of Mathematics Garden, by Nick Bailey, is 'a clebration of the beauty to be found in the mathematics and algorithms that underpin all plants'. It is a grand theme, putting me in mind of seventeenth century sundials and of Charles Jencks' Garden of Cosmic Speculation. As with Jencks garden, which I admire, the use of shapes generated by mathematics is much more pleasing than the use of formulae as inscpritions on garden furniture and fittings. The Hartley Botanic Garden by Catherine MacDonald is the 2016 garden I would most like to have bought - but definitely not from the catalogue, in which the drawing is unappealing and the text off-putting. I would not want to own something because it 'celbrates British-engineered glasshouse structures created by Hartley Botanic'. But I would love to have a 'cool, cool, cool retreat with views over a pool and into a beech wood. It would be a perfect place to write a book. The Royal Bank of Canada Garden was inspired by 'the Mediterranean pine habitat of Jordan', which is puzzling. The designer, Hugo Bugg, says this 'illustrates how arid landscapes can have beautiful flora'. This is very true - and is well illustrated by the design. But what are the connections between Canada and Jordan and pyramids? The Harrods garden is said to have been inspired by Heath Robinson. I suppose the rotating trees fit the bill but the garden is insufficiently eccentric as a tribute to the great Robinson - which is something one could not say about its designer, Diarmud Gavin. The Cloudy Bay garden, by Sam Ovens, is said to be inspired by the company's 30-year wine-making heritge. I can't see this at all, but appreciate the good use wood, water and grasses to create 'a secluded retreat'. The ‘Hillier in Springtime’ garden by Sarah Eberle is the best garden design I have ever seen in the Pavilion - and I hope it encourages other exhibitors. The Chelsea gardens show every sign of being bigger visitor draws than often-kitschy plant displays in the Pavilion. The tour includes a full day at the Chelsea Flower Show, which is the most famous horticultural event in the world, a visit to one of the best known Arts and Crafts gardens in England ( Sissinghurst ), a tour of the RHS's flagship garden ( Wisley ) with its new glasshouse, and a visit to one of most complete historic gardens and estates in England ( Tatton Park ).